I descended through my own mind into a place of relaxation and detachment from everyday concerns. Since my initial intention was to seek the ancestors, I went to an Underworld entrance, a cave in the farther recesses of this in-between place. The robed and towering Gatekeeper asked, "Who are you?" The response, not understood by the me at the time, but known by the I, stated, "I am the Greatest and the Least and all in between. I am you and you are me." The hood nodded and I had the impression of a smile then he stepped aside. I entered the absolute darkness of the tunnel and began to walk. 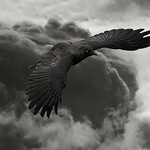 Suddenly I felt Her presence and I was transformed into a raven, flying along. I understood then that there was something else for me to do this day. Exiting the tunnel I found myself in the skies over a swath of destruction. The personality me realized that this was the shores of the eastern coast, decimated by Hurricane Sandy a few days earlier. In this raven form I landed on the body of a deer and pulled a piece of flesh with my beak. The personality found herself a bit grossed out, as it were, but accompanied by the understanding that this is an exchange of energy, of feeding to live. I looked up then and saw the spirit of the deer, waiting. I opened the Veil and it passed through to the monad, the group soul of "deer," that energy which shamans call upon. I closed the doorway and lifted off, going to the next destination. I saw the spirits of a girl and a boy looking bewildered, they had been killed by a falling tree and were confused. I immediately returned to human form and gathered them in my arms. The personality nearly broke into tears but "I" reminded her: don't take this personally. Yes, you may feel a mother's grief but you cannot keep it. This work will destroy you if you do. Upon opening the portal, there was an immediate explosion of love and joy from the other side, many loved ones welcoming those two spirits home who went with gladness. Sorrow eased from seeing this, I continued. Returning to flight I found myself going through the window of a bedroom. It had a feeling of almost sterile, a lack of personality so I suspect it was a hospice or similar. The very elderly woman passed out of the body as I came to her side, still decrepit and huddled upon herself. "Remember who you are," I told her. The spirit straightened, years dropped away, becoming the beautiful woman she knew herself to be. 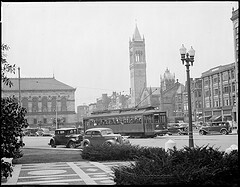 The portal showed 1930's Boston (I later went looking for a picture to approximate what I saw, so here you are). I knew she was going to the astral side of the happiest time of her physical life. She stepped through without a backward glance. The final trip for the day took me to a flooded home and the body of a man floating face down. His spirit was afraid and did not want to cross over. I simply informed him that this is the best thing, to move on. However when I opened the door I went through with him... and found myself in Hell. The darkness was lit only by sullen red light and feeling of pain. I turned to him in surprise. "You don't deserve this." His face showed calm acceptance that the worst had come to pass. "Yes, I do." I reached up and grabbed his head, putting his forehead against my own. Images, memories of his flashed before me and I understood that he had succumbed to temptations of a horrible sort: pedophilia. I released his head and watched him for a moment. I could feel that he was not inherently "evil," though the choices he had made could certainly be considered so. We both knew that he felt he deserved to be in Hell, that he had karma to pay. I nodded but said, "When you know you no longer need to be here, you can leave." He simply looked at me then turned away. I left then and flew back through my tunnel to home. I was very weary and the personality struggled with processing all that had passed. This intense experience has given me some insight into the nature of the "other" side and how people create their reality. Since this I have had more travels and continue to develop my own understanding of spirits and greater reality. This is part of what I do for my Goddess, out of sight but not out of mind. I realize too that these are real people and that their relatives could become aware of this post. I only hope that if they do that it brings them closure.